What Does It Mean if Your Face Is Numb After You Exercise? If you've noticed numbness or tingling in your face after exercising, then you're not alone. Facial paresthesia has multiple causes, ranging from mild to serious. If you've noticed this symptom after exercising, you may want to pay attention to your symptoms and try to determine the cause. If your loss of sensation lasts for an extended period of time, make an appointment with your healthcare professional to help narrow down your symptoms and figure out the root cause. Since your nerves are responsible for sensation in all parts of your body, injuring one can cause a loss of feeling in your face or extremities, depending on the location of the damage. Although nerve damage may be caused by trauma to the area, you may be suffering an injury due to improper weight training. Lifting weights that are too heavy or using improper lifting technique puts greater pressure on the spine, potentially causing an injury. Improper weight training techniques over time especially put you at risk for bone stress injuries and nerve damage. If you frequently lift weights, ensure that you're lifting the appropriate weight with the correct technique. Damage to the nerves or bones in your face also cause numbness, especially around the cheeks and lips. You may not realize that you've damaged this area, but if you've been hit in the head with a ball or experienced any type of facial trauma recently, numbness is a common symptom as well as blurred vision and swelling in the area. Because a sports injury may be serious, if your numbness could have been caused by facial trauma, apply ice and then see a doctor. When exercising, your body sweats out electrolytes and uses up plasma calcium for muscle contractions. If you're not replenishing these minerals after exercise, you may experience tingling and numbness in your face and extremities. In some cases, a vitamin B12 deficiency also causes a lack of sensation. Make sure to pay attention to your overall nutrition, especially when you exercise. 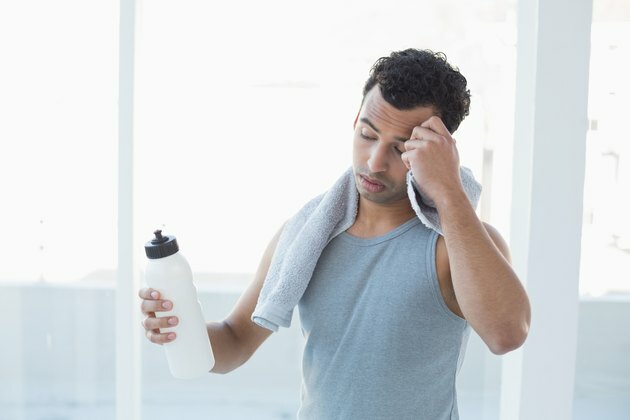 Hydrating with an electrolyte rich beverage after exercise is a simple change to your workout routine, but may resolve this symptom. Be sure to also pay attention to your overall diet, making sure that you're getting adequate vitamins and minerals. In some cases, numbness and lack of sensation in your face may be a sign of a serious condition or disease. Diabetes reduces blood flow and can cause numbness in the head and face. Individuals with multiple sclerosis also experience decreased sensation as a result of their disease. In some cases, these symptoms may be caused by a stroke, migraine, certain medications and mild seizures. You may even have decreased sensation due to exercising outside in cold weather. Although this symptom may be mild, regularly experiencing facial numbness after exercise should prompt you to seek out a doctor's opinion. Disorders of the Nervous System: Alexander Reeves, M.D. and Rand Swenson, Ph.D.